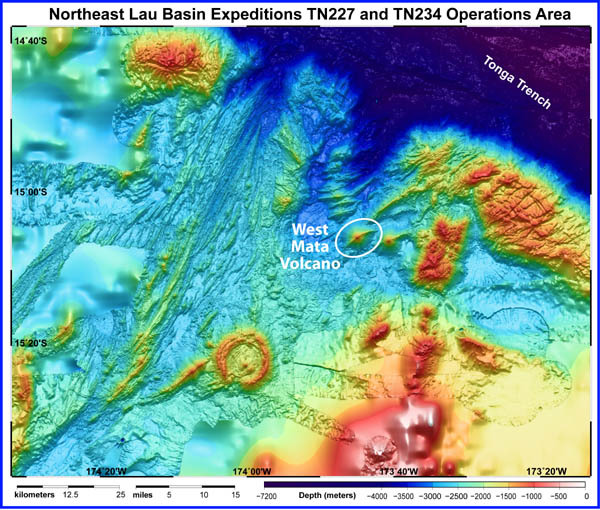 The West Mata Volcano, encircled by a white ellipse on this bathymetric map, is not the largest volcano in the northeast Lau Basin, but appears to be the most active. This map represents the area visited and mapped on two recent NOAA EOI Program expeditions to the area. 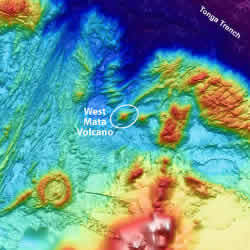 The summit of West Mata Volcano is nearly one mile deep the base is nearly two miles deep. 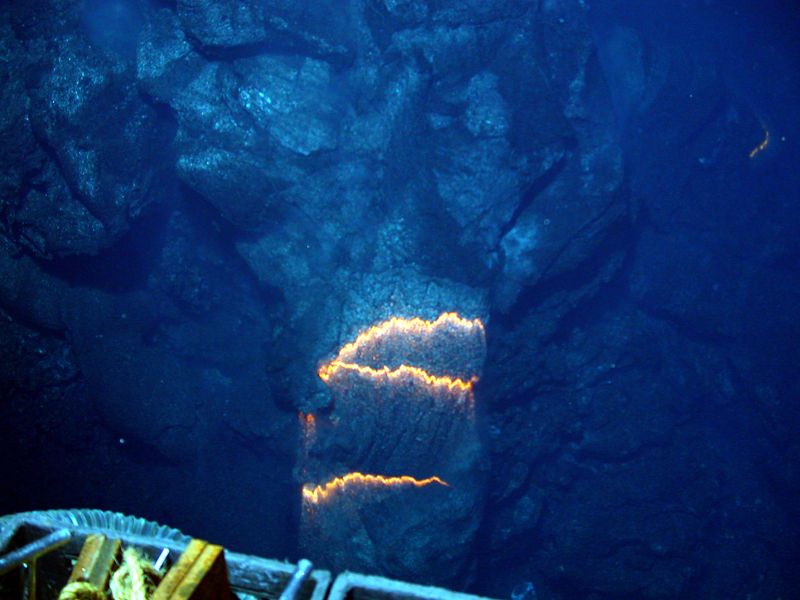 The Tonga Trench to the north and east of the expedition area is nearly seven miles deep. 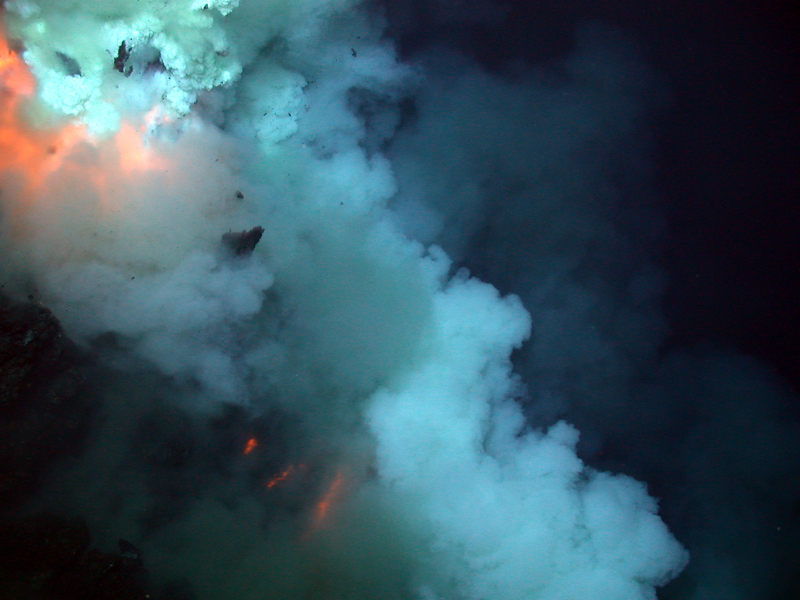 55 video highlights from the 2012 Submarine Ring of Fire Expedition on YouTube. Video courtesy of MARUM, University of Bremen and NOAA-Pacific Marine Environmental Laboratory. From ROV Quest aboard the R/V Revelle in 2012. Video was obtained by camera mounted on the Jason remotely operated underwater vehicle. The Jason team and scientists were on board the Research Vessel Thomas G. Thompson. Jason was lowered to the site 4000 ft below on a ~3/4 inch fiber optic cable while the ship held position above. The pilots maneuvered the Jason carefully into position to view the eruption. The sound on the video clips was recorded separately on a hydrophone (underwater microphone) placed on the seafloor about 50 ft away and later synchronized to the video. Video courtesy of National Science Foundation and National Oceanic and Atmospheric Administration (NOAA). More information on the expedition is available on the 2009 Lau Cruise Blog. NOTE: Click on compressed or uncompressed to begin download. These are large files and may take several minutes to download. For best viewing of the videos, download the files to your computer, and play them from that location rather than from the DVD. Video of the discovery of West Mata on the NOAA PMEL YouTube channel. and select the movie from the list. 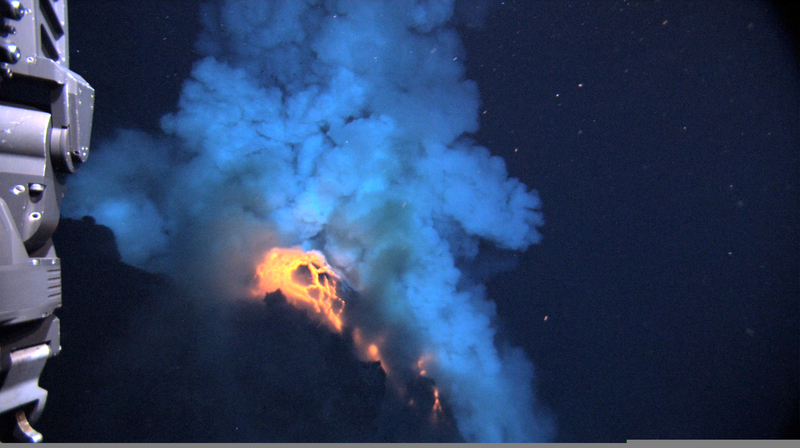 An explosion near the summit of West Mata volcano throws ash and rock, and molten lava glows below. This image is approximately six feet across in an eruptive area approximately the length of a football field that runs along the summit. Image courtesy of NSF and NOAA. An eruption near the summit of the West Mata Volcano. 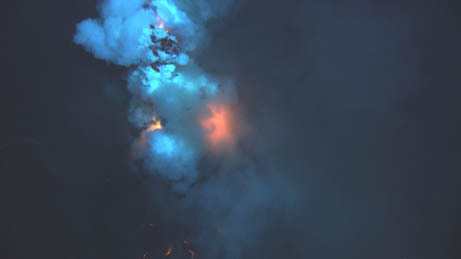 The blast is in the top left portion of the image, and broken rock can be seen in the plume. The three red lines below the blast are bands of superheated pillow lava flowing down the volcano´s slope. Image courtesy of NSF and NOAA. 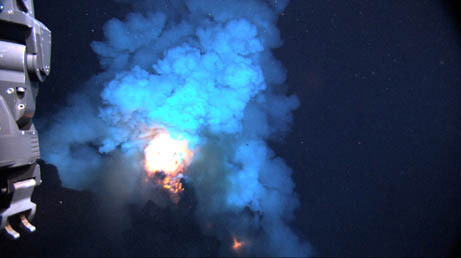 The eruption produces a bright flash of hot magma that is blown up into the water before settling back to the seafloor. 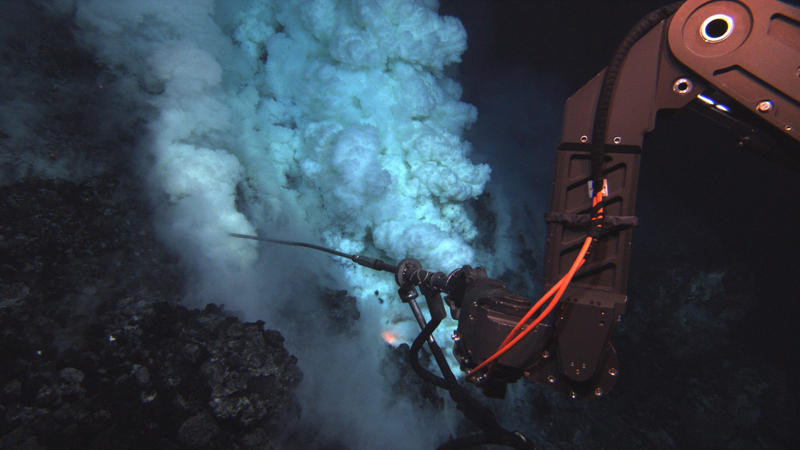 In the foreground is the front of the Jason remotely-operated vehicle (ROV) with sampling hoses. The area in view is about 6-10 feet across in an eruptive area approximately the length of a football field that runs along the summit. Image courtesy of NSF and NOAA. The orange glow of magma is visible on the left of the sulfur-laden plume. This image is approximately six feet across in an eruptive area approximately the length of a football field that runs along the summit. Image courtesy of NSF and NOAA. The Jason remotely-operated vehicle (ROV) samples fluid at an eruptive area near the summit of the West Mata Volcano. The fluid sampling "wand" is approximately three feet long. Image courtesy of NSF and NOAA. This is a side-view of an eruptive area, with magma and rock fragments cascading down the volcano´s slope. This image is approximately nine feet across in an eruptive area approximately the length of a football field that runs along the summit. Image courtesy of NSF and NOAA. The summit of the West Mata Volcano, shown here in red, is nearly a mile below the ocean surface (1165 meters / 3882 feet), and the base, shown in blue, descends to nearly two miles (3000 meters / 9842 feet) deep. 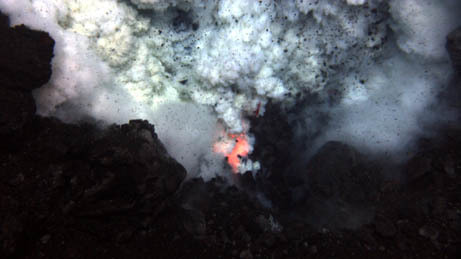 The eruptive activity occurred at several places along the summit, in an area approximately the length of a football field. The volcano has a six-mile-long rift zone running along its spine in a SW/NE orientation. 3D image courtesy of NOAA. 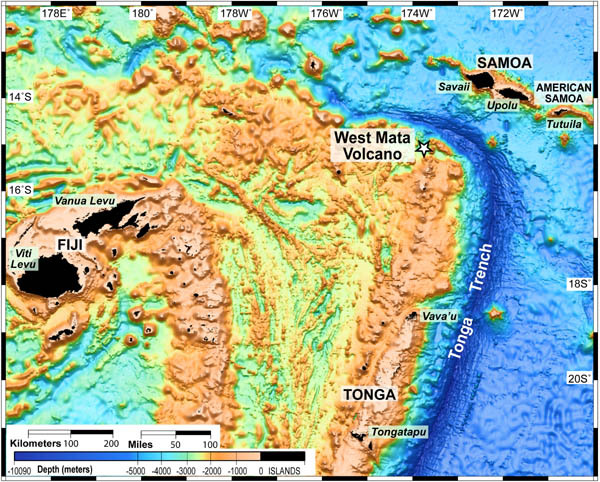 The West Mata Volcano, encircled by a white ellipse on this bathymetric map, is not the largest volcano in the northeast Lau Basin, but appears to be the most active. This map represents the area visited and mapped on two recent expeditions to the area. 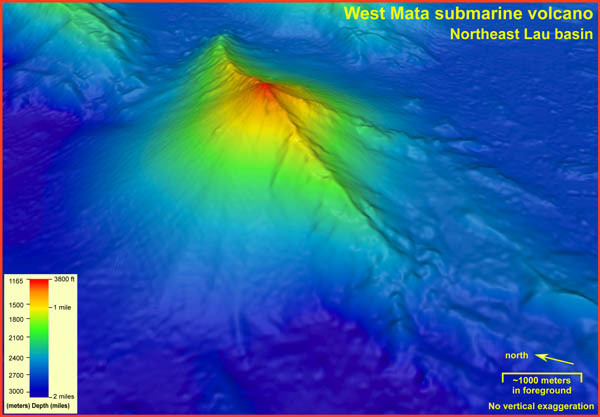 The summit of West Mata Volcano is nearly one mile deep the base is nearly two miles deep. 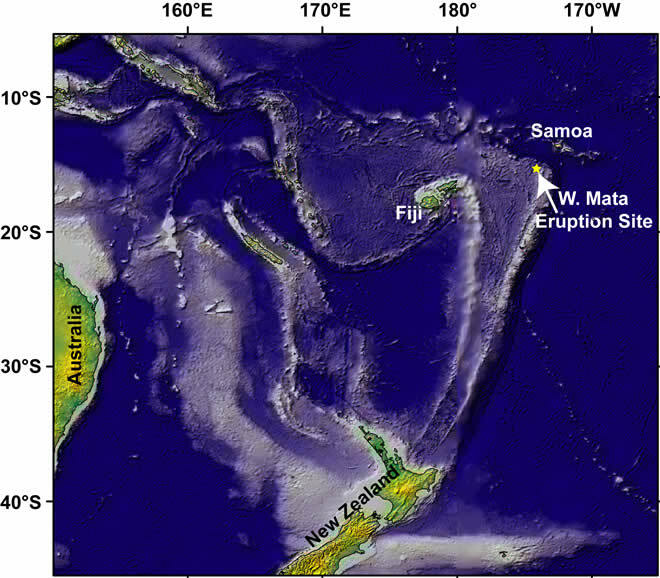 The Tonga Trench to the north and east of the expedition area is nearly seven miles deep. Map courtesy of NOAA. The West Mata Volcano is in the Lau Basin. 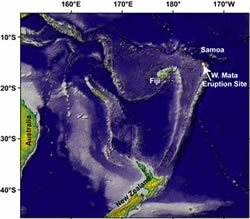 The Lau Basin is located in the southwest Pacific, within an area bounded by Samoa, Tonga and Fiji (the black areas on the map, which are the only areas above water). 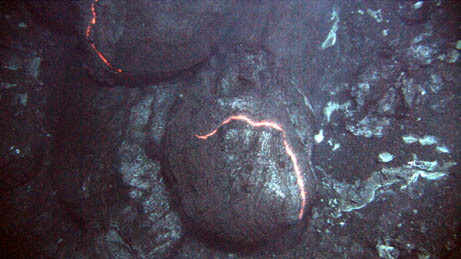 This area is home to many submarine volcanoes, but very few have been explored. Map courtesy of NOAA. 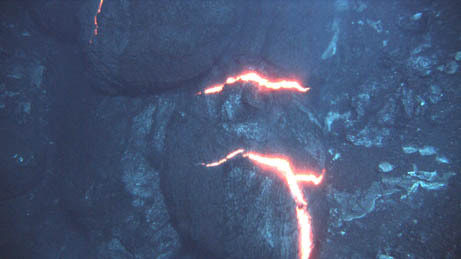 Superheated molten lava, about 2200 degrees Fahrenheit, is about to explode into the water in this image. The area in view is about 6-10 feet across in an eruptive area approximately the length of a football field that runs along the summit. Images courtesy of NSF and NOAA. These are consecutive images. The orange glow of superheated magma, about 2,200 degrees Fahrenheit, is exposed as pillow lavas extrude from the eruption. These images are approximately three feet across in an eruptive area approximately the length of a football field that runs along the summit. Images courtesy of NSF and NOAA. Bands of glowing magma, about 2,200 degrees Fahrenheit, are exposed as a pillow lava tube extrudes down slope. This image is approximately three feet across in an eruptive area approximately the length of a football field that runs along the summit. Image courtesy of NSF and NOAA. 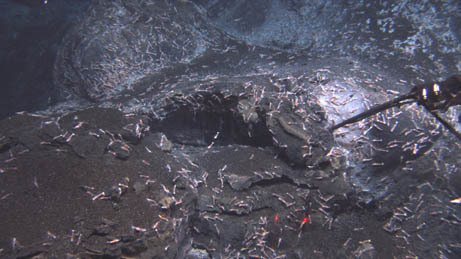 Shrimp congregate near the summit of West Mata Volcano and may be the same species as those found at eruptive sites more than 3,000 miles away. This image is approximately nine feet across in an eruptive area approximately the length of a football field that runs along the summit. Image courtesy of NSF and NOAA. 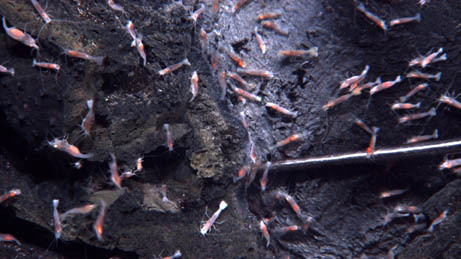 A close-up view of the shrimp at the summit of West Mata Volcano, which may be the same species as those found at eruptive sites more than 3,000 miles away. Image courtesy of NSF and NOAA.